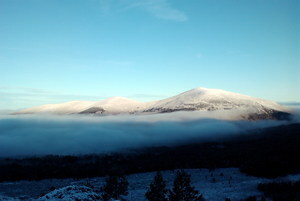 Está a nevar em Cairngorm ?Obrigado! 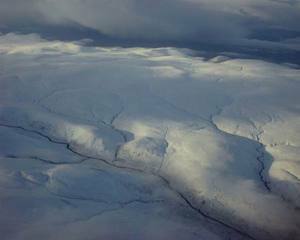 The spiritual home of winter sports in Britain. 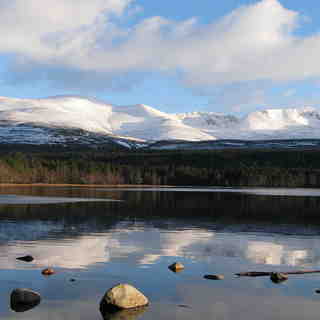 Cairngorm and the nearby town of Aviemore have supplied all the recent big names in the British ski scene. From Emma Carrick-Anderson, to the fabulous Baxter Boys and Lesley McKenna. On its day Scotland can offer some great riding, nowhere better than here. Sadly, those bluebird days are undeniably scarcer than they were in decades gone so that the new mantra at the ski resorts is diversify or decline. 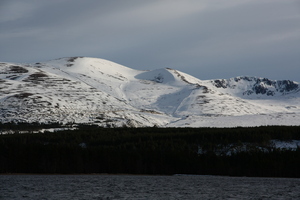 Cairngorm is now just as important for summer mountain-biking as it is for skiing. On a bad winters day dress for horizontal rain and snow whipped along by some of the most ferocious low-altitude winds on the planet. The prevailing westerly weather moves quickly off the Atlantic and so skiing here is all about timing; avoiding the mild SE gales that eat into the snowpack and force lifts to close and making the most of a brief ridge of high pressure that follows a snowy northerly. 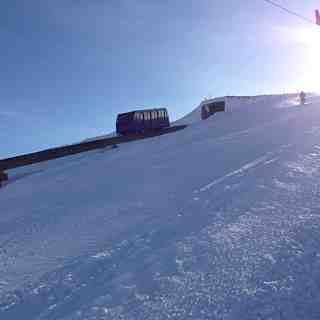 Time it right, and you can find perfect conditions on and off-piste at Cairngorm and in cold winters, where the conveyor of Atlantic storms abates and continental air rules, you can find week after week of great conditions and even powder days. The skiing here is situated on the sixth highest mountain in Britain but that's still not high enough to be really snow sure. 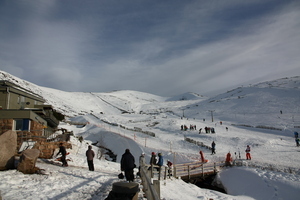 A funicular railway should help the mountain stay open during times of high winds and reduced snow cover low down; 5 cannons assist snow-making. 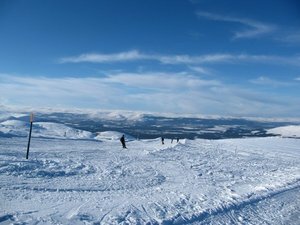 Off the slopes, at Cairngorm, there is plenty of accommodation in Aviemore and the surrounding villages and the alternative little resort of Lecht is an hour away by road. Nightlife is lively. Just had a great day skiing on the Thursday of the week after Easter with very small queues, perfect snow on most runs above the mid station and mostly sunny weather. My only criticism is that the short beginners Poma was running a bit fast for an unmanned beginners lift. My daughter got clouted hard before I could get in a position to fend off the buttons.